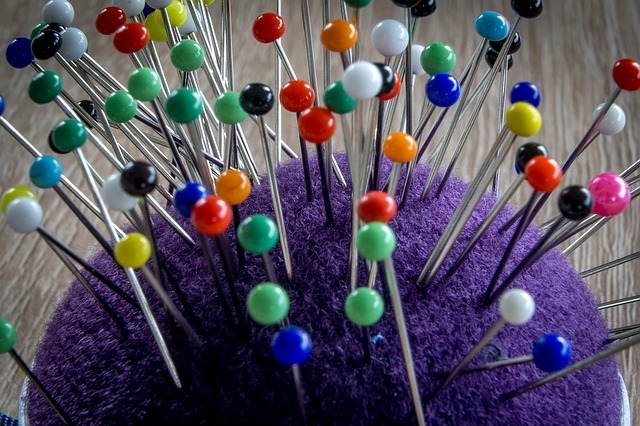 Use a pincushion to store your pins – not your mouth. I’ve put this top of the list as it’s one of my worst sewing bad habits. I openly admit that I commit this offence every day. Apart from this practice being dangerous and thoroughly unhygienic, you’ll scratch your teeth. My dentist knows I do this and chastises me about the state of my enamel during every check-up. So if you won’t take a telling from me, then on behalf of dentists everywhere, don’t hold pins in your mouth! There’s nothing more frustrating and down-heartening than spending lots of time and effort on a sewing project and the item not fitting well. Not to mention wasting £££’s on fabric. When all that was required was a few minutes spent taking accurate body measurements and checking these against the pattern. One of the most common sewing bad habits is diving in without checking the pattern measurements. But remember that commercial paper patterns aren’t sized in the same way as ready-to-wear clothing bought from the high street. When sewing, you usually have to go up 2 or 3 sizes. So if you’re normally a size 12 in shop-bought, then you may have to use a size 16 or even a size 18 pattern. And if you’re not the same size all over, then alter the pattern accordingly. If in doubt, make a ‘toile’ from calico or some other cheap fabric first. It will be worth the extra effort. 3. Not washing your fabric before using it. Fabrics bought straight off the bale have finishing treatments applied which make them firmer. This can lead to them getting creased and being difficult to handle. Also it’s more difficult to cut out when the fabric has folds that won’t smooth out so washing will remove these. Also natural fabrics such as cotton, linen and especially wool can shrink when washed. Wouldn’t it be a shame if you invested a lot of time making a gorgeous new dress, then it was too tight after its first wash? There’s nothing so satisfying than being able to lay your hand on your scissors, tape measure, pins and chalk while you’re working. So keep only the essential items out on your sewing table that you’re likely to use for that project. 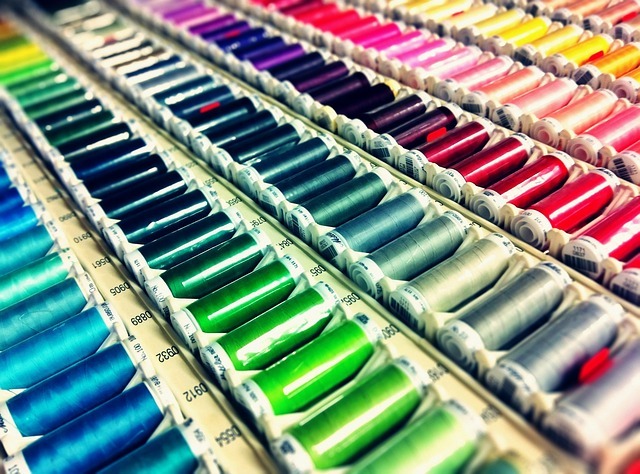 Tuck away the suitcase-sized sewing box containing every sewing tool in the haberdashery shop, your entire lifetime collection of thread reels, a doll’s left arm, a small red plastic tractor (? ), and the key that doesn’t fit any lock in your house. You know exactly what I’m talking about! So you’re in a rush to finish your sewing project. You’ve cut out your skirt pieces so take off the pattern and put it away. First sewing stage; darts! You remember roughly where they’re meant to be – right? So you have a couple of attempts and the left one is almost the same length as the right. And who’s going to notice that it’s slanting a bit? You carry on and sew up the side seams, then try on the skirt. The darts look terrible! They’re all puckered and lumpy. So you unpick the darts, get out the pattern and lay it against the skirt, marking as best you can. Which isn’t very accurate as the garment is now 3-dimentional. All this takes an extra half-hour, and still isn’t looking great. Not taking an extra few minutes to transfer the key pattern markings onto your fabric isn’t a short cut. It’s one of the worst sewing bad habits. It makes any project more time-consuming and difficult and you’ll end up with an inferior result. This is one of the sewing bad habits that immediately flags the item as ‘homemade’. Puckers and wrinkles can be seen from a dozen paces. When you’re sewing, you should iron every seam when you’ve sewn it, before you continue to the next stage. This helps the thread settle into the fabric, so you obtain a smooth crisp seam which will lie perfectly flat. 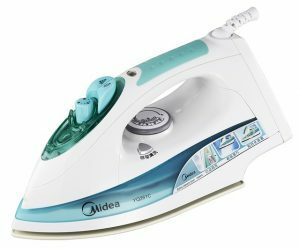 If you can, have an iron and board in your sewing room, or set up next to your sewing table. If you have to go into another room to press every seam, or downstairs, then you’re going to skip the pressing, aren’t you? Professional seamstresses and tailors will press as much as they sew and if you adopt this good habit, you’ll see an immediate difference in the quality of the finish. There’s nothing more off-putting and likely to dissuade you from starting a sewing project than the thought that you’re going to have to make a toile or alter a paper pattern. If you’ve got a style that you’ve made before and fitted it perfectly, then it’s so quick and easy to make it again in a new fabric. Once you’ve altered your garment and achieved a good fit, take notes of the alterations you’ve made and amend the pattern. That way you’ll have a perfectly-fitting pattern ready to whip out and whizz up that dress/skirt/shirt next time you’ve got a free evening. If you know you’re going to have to test the pattern and make alterations again, you’re much less likely to sew anything at all. I don’t advocate buying expensive thread if you can find a cheaper alternative. However don’t skimp on thread quality. Good thread doesn’t always have to cost a lot and it’s not worth giving yourself the headache of try to sew with bad thread. How many times do you want to re-thread your needle before you give up completely? The way to tell if it’s likely to be poor quality is to hold a short length up to the light. Is it evenly spun, or uneven in thickness? Is it smooth with a sheen, or is it matt with a fluffy appearance? A poor-quality thread will be uneven in thickness (meaning it won’t ‘flow’ smoothly through the machine. It could cause tension problems and is more susceptible to breaking. If it looks ‘fluffy’ then it will shed more lint. You could also try the ‘snap’ test. Wrap a little around your index fingers and pull. If it breaks easily, then don’t buy it. Gütermann is a popular brand and is available is most haberdashery and craft retailers but at around £1.90 for 100m, it’s quite pricey if you’ve a large project. Mettler ‘metrosene’ is superb if you can find it and is about the same price as Gütermann. Moon is another good-quality thread that I’ve used for years without any problems. It’s widely available in fabric shops or online and at around £1.30 for a 1000m reel, is much cheaper than Gütermann, although the range of colours is limited. A thread that I’ve recently discovered is available in Lidl. They have a pack of 20 x 500m reels for £2.99. This works well in my sewing machines so I’ve been using it in the studio for around 2 years now. It has more sheen than most all-purpose polyester sewing threads so it’s also lovely for machine embroidery. And as the high speeds involved in Free-motion embroidery impose huge strain on thread, this is usually the best test of quality and it holds up extremely well for this purpose without breaking. For some reason however, it doesn’t perform well in my overlocker. But as Lidl also occasionally have 3000m cones for overlockers priced at £1.49 or 2 for £2, I snap them up when I can. Overlocker cones also run well on the sewing machine – just pop the cone into a mug and stand it behind your sewing machine. 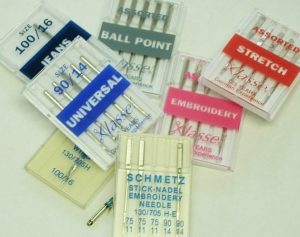 For excellent quality threads for all sewing purposes at a reasonable price available online, try www.empressmills.co.uk. Fabric and threads release tiny fibres as they’re being sewn, known as lint. This lint builds up around the working areas of your machine. Take a look at the needle area and around the bobbin – see all that fluff? If you don’t remove it regularly, that lint will become compacted and will affect the machine’s performance. It will eventually shorten your machine’s life. It can even cause your machine to seize up completely. It’s happened on several occasions in the studio during a class when someone’s brought along an older machine that’s been poorly maintained. Sewing machines have been known to catch fire too, because of the build-up of lint combined with oil. It’s a lethal combination to a sewing machine, so this can be a very expensive sewing bad habit. So, when you change your needle after 8 hours of sewing (see above), take that opportunity to run a clean soft brush around the machine and flick out the fluff. Check around and under the bobbin case too. And never blow, tempting though it may be. This only pushes the lint further into your machine and the moisture from your breath will condense on the machine’s working parts. Check your manual for instructions on oiling the machine too. A spot of oil every few weeks will keep it working away happily, extending the period between which you need to have the machine serviced, and ultimately extend its life by years. 11. 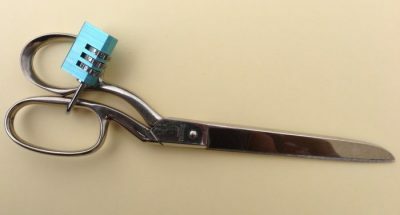 Using your dressmaking shears on things other than fabric. An experienced sewist will never do this. 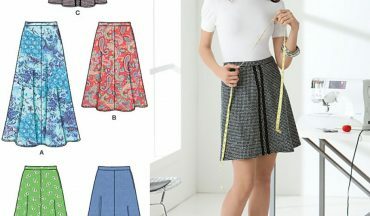 But if you’re new to sewing, you may be tempted to grab the first pair of scissors you can find to cut out your paper patterns, or even to cut open that newly-delivered parcel. Please resist this temptation! Other substances will blunt your shears and there’s nothing worse than trying to cut your fabric accurately with dull shears. You may as well chew out the pieces! And by the way, synthetic fabrics will also blunt your dressmaking shears. Fleece is the worst offender and as far as I’m concerned it’s the Devil’s cloth! So invest in a quality scissor sharpener, or take them to get sharpened regularly. And if you ever find your dressmaking shears in your Husband’s toolbox, insist that he buys you a new pair immediately, and this time lock them up out of harm’s way. This is more than just a sewing bad habit; it can be dangerous to your health. It may seem obvious but make sure you’re sitting in a comfortable position when you sew. 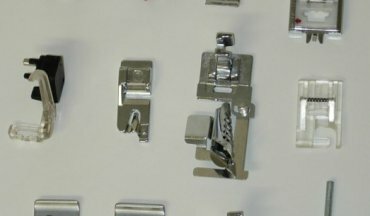 Treat your sewing machine as if it’s a computer and you’re sitting at your work desk. Your feet should be planted on the floor, your lower spine firmly supported in the chair so you’re sitting upright and not slumped. Your shoulders should be relaxed and ‘soft’ – not tensed up to your ears. Hours spent sitting in a poor position will cause headaches, back and neck pain, whatever the activity. Long term, bad posture can cause permanent nerve damage. Sewing can sometimes be a pain in the neck – but it shouldn’t be literally. Also make sure you’ve got good light. If the light on your machine isn’t bright enough, then use a desk lamp to light your working area. Sewing does cause strain on the eyes so take regular breaks (stretch out your back and shoulders at the same time). And if you normally wear specs for close-up functions such as reading, then you should probably wear them for sewing too. In all my classes, I teach what I personally believe to be ‘best practice’. 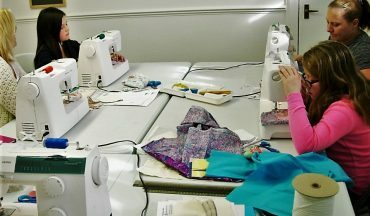 So why not update your skills in a Refresher Sewing Course, or a Dressmaking course?